a ticket to the Olympic Park. Olympic Park ticket's price is 200 RUB. Olympic Park is a holiday! We’ve made sure that during the Games the Olympic Park is filled with a festival atmosphere: music shows, wonderful awards ceremonies, gala concerts featuring world-famous stars and a rich and vibrant entertainment program for the entire day. In the public zone of the Olympic Park alone, there will be more than 100 street performers every day. Their job? To create the festival atmosphere! Specifically for the Sochi 2014 Games they’ve created a unique program featuring pantomime and clowns, circus and acrobats, capoeira dancers, and the best national break dance groups. Spectators can join the performers for flash mobs and interactive music shows. There are daily costumed parades and performances by musicians from all over Russia, representing the cultural variety and authentic character of the country. For the youngest visitors to the Olympic Park there is a children’s playground visited by animators and face painting artists, who can turn a kid into a Ray of Light or a Snowflake in a matter of minutes. For kids of all ages the symbol of Russian winter, Ded Moroz, comes out of his residence for an interactive program with visitors. Of course, the Games will be attended by the main symbols, the Paralympic mascots: Ray Of Light and Snowflake. They will greet guests to the park and pictures can be taken with everyone who wishes to do so. The fans will be offered face painting with flags of participating countries. The best places for picture taking will be marked with a special sign with #SOCHI2014 hashtag. 30 various activities of the Olympic Park are arranged in order to provide visitors with the most interesting and exciting program, to create a fun and festive atmosphere and to show the diversity of all countries and nations - all in one place. The exposition of Russian regions is the biggest exhibition of the Park consisting of eight parts (federal regions of the Russian Federation), each of them presented in their own unique style, a place where everyone can have a virtual tour of the whole country and see live the national song and dance performances. 1) Visitors to the Moscow and Central Federal District exposition can participate in unique workshops dedicated to ancient crafts that formed the essence of national Russian folk arts: Palekh miniatures, famous Gzhel ceramics, painted enamel, toys, laces and weaving – just a small part of the packed program prepared for the visitors. 2) Far-Eastern Federal District – here, visitors will have a chance to visit each region of the Russian Far East: see what the coldest Yakut winter is like; get the mountain skiing experience on a virtual track; find themselves inside the beautiful scenery of Sakhalin island and take photo;, find the gold reserve of Magadan, escaping the various obstacles such as rushing rivers and ferocious bears; see the collection of famous Yakut diamond;, participate in a tea ceremony; and taste organic herbal drinks. 3) The North-Western Federal Region offers its visitors a virtual tour of the famous landmarks and breathtaking landscapes of the area. At any stand, visitors can take a digital picture with their favorite places in the background and send it by email directly from the screen; anyone will be able to participate in original workshops of amber processing, porcelain painting and embroidery as well as join the dance lessons and music games. 5) The Siberian Federal District promotes Krasnoyarsk, the host city of the forthcoming 2019 Winter Universiade. The stand will also organize workshops which will demonstrate to the visitors the authentic techniques of loom weaving, straw weaving, bark painting, clay shaping and pottery art. 6) The Ural Federal District presents the landscape model made of synthetic and natural materials, the Ural’s former champions will give interviews and autographs to stand visitors, the exposition will organize the exhibition of unique products and rare materials, and the ethnographic exhibition with mammoths, national houses and much more. 7) The Southern Federal District - visitors to the exhibition will be able to compare their height with Peter the Great, compare their hand size with the hand stamp of the first Russian emperor (the original stamp was made ​​in 1707), see the ship of the Petrine era, and interactively communicate with Anton Chekhov, the famous Russian writer, who was originally from Taganrog, a city in Southern Russia. Visitors will also be able to see the authentic attributes of the Cossacks (east Slavic communities), sample the taste of Don cuisine, and see performances by the strongest man on the planet. 8) The Volga Region Federal District will organize an exciting interactive journey of the most famous regions of the area, a giant-size screen will broadcast video films, and visitors will receive gifts and souvenirs and experience the true Russian hospitality. Coca-Cola’s traveling exhibit "In Motion!" promotes the importance of an active lifestyle. After the Winter Games, the exhibit will set off on a journey through other cities across Russia. This spectacular journey into the world of Coca-Cola enables visitors to learn about the company's history, brand, ingredients of the legendary beverage, and company relations with the Paralympic Movement and sport. It also features interactive sites where everyone can learn how to be physically active both at home and outdoors, and train like professional athletes. The OMEGA pavilion is an impressive, two-storey structure that showcases the brand's long-time involvement in the Games as Official Timekeeper. The ground floor is open to the public and visitors will be able to see demonstrations at the watchmaker’s table, discover OMEGA's timekeeping innovations, view a 3D speed skating video, explore the interactive bobsleigh simulator and browse some of the brand's most historical timekeeping instruments in an inviting environment. In the Samsung pavilion, the company's latest products will be on show, and interactive games, competitions and promotional activities will be organized for visitors. Samsung Galaxy Studio at the Olympic Park is composed of shipping containers that have traveled to 15 cities in Russia, collecting encouraging messages, dreams and hopes for the Winter Games. Now these special containers are in Sochi, ready to provide people with a new and exciting set of experiences that Samsung mobile offers. You can enjoy the following activities with Samsung Galaxy Note 3: free rental service, virtual experiences of winter sports games, creating accessories with 3D printing, and Galaxy Theater. MegaFon Presents MegaFaces. The MegaFaces pavilion at the Sochi Olympic Park is an interactive and innovative venue with a façade of thousands of giant 3D portraits of each visitor’s face, created using a special scanning procedure. Every visitor will be able to pass through the 3D scan and become part of history. The 3D portraits are made up of 11,000 actuators within the pavilion’s facade behind a stretchy fabric membrane. Each actuator can be extended by up to two meters, which allows it to define three-dimensional form on an architectural scale. The author of the project is Asif Khan, a well-known British architect from London. In the Rosneft pavilion, there are nine zones: interactive games, competitions, and presentations using "augmented reality" technology. 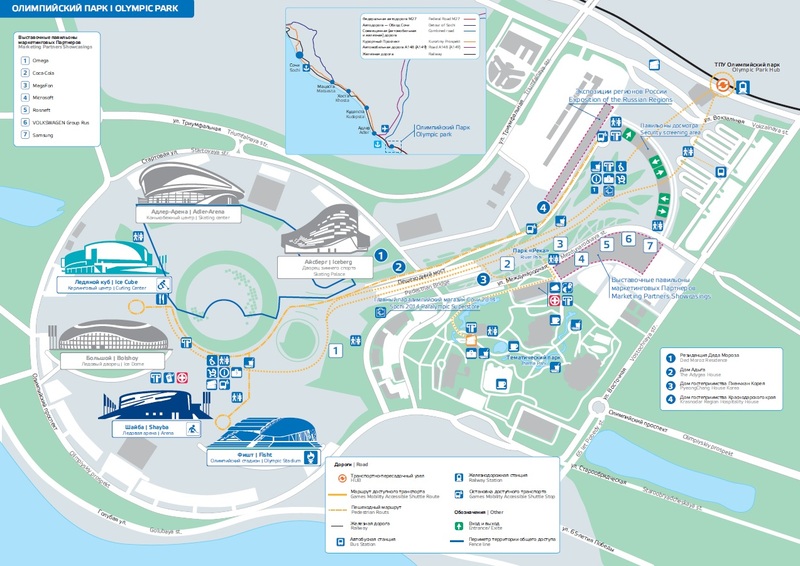 The pavilion's plasma screens will broadcast real-time competition results and show a map of the Olympic Park. In addition, using interactive touch panels, fans can leave their wishes and reviews, propose the best "chant," paint their faces in the colors of their team flag and, on special realistic computer simulations, can ride on skis or a snowboard. Visitors to the Rosneft pavilion will also be treated to a unique animated journey into the history of Russian successes. Located in the Coastal Cluster, the VOLKSWAGEN Group Rus pavilion is the center of attraction for all visitors to and participants of the Games. Here you will find live sports broadcasts, cars, breathtaking dance shows and world famous stars! A huge interactive screen in the pavilion will keep you up to date with the major sports events as well as being able to witness a unique dance show, Living Medal Count, staged by Ilya Averbukh. For all visitors there is also a special exposition of the vehicle fleet, displaying the latest technological achievements. In addition, everyone in the pavilion can watch live broadcasts of the main sports events and interviews with famous athletes, and the lucky ones will be able to attend a Morning Show at Mayak’s radio booth. More surprises are waiting for you - do not miss it! The Main Paralympic Shop, located near the Medal Plaza, features an area of over 5,000 square meters. The shop, made in the form of three mirrored cubes is certain to attract the attention of Olympic Park visitors. More than 2,000 licensed Sochi 2014 products are available for purchase: colorful pins and key chains, children's educational toys, unique clothing and accessories for pets, all the beloved mascots of the Winter Games, and much more. The Sochi 2014 clothing collection is also available for purchase, including sweatshirts, several types of tracksuits, long and short sleeved polo shirts, warm jackets and trousers, sweaters and cardigans, men's large knit jersey apparel, and t-shirts; there is also a large selection of accessories. BOSCO, General Partner of the Sochi 2014 Games, opened 30 shops with a total area over 10,000 square meters at all competition and non-competition venues, in Paralympic Villages and Media Centers. The Krasnodar Region House will demonstrate the real Kuban hospitality and tell more about the national identity and traditions of the people who inhabit the region hosting the 2014 Winter Games. Exhibits at this House feature several themed areas. The Adygea House will host many exciting performances by Adygean cultural groups, plus shows featuring clothing made by skilled local masters. The Kunatskaya House will host meetings between elders of the Adygean community of Kuban and visitors to the House. In the Hospitality House of Korea “Pyeongchang 2018”, all visitors can experience the ancient Asian culture, listen to Korean music and see performances of national dancing. The Ded Moroz Residence, created in unique Russian style, is a place where you can see the main character of the Russian winter - Ded Moroz. Children and adults alike will be interested in visiting the crafts workshops, can dance “khorovod” (the combination of Russian circle dancing and chorus singing) around the Christmas tree, and meet the friends of Ded Moroz - Snegurochka from Kostroma, Chyskhaan from Yakutia, Yamal Iri from Salekhard, and Pakkaine of Karelia. And anyone can send a letter to Ded Moroz here and even get a reply. Young visitors to the Olympic Park can spend time and have fun at the children’s playground. In addition to all of the above the Park guests will be able to see and enjoy the street theater performances, flash mobs, dances, parades and much more. The Olympic Park also contains the Sochi Park Theme Park. Olympic Park visitors can access the Sochi Park Theme Park area for free. In the Sochi Park Theme Park visitors can stroll through the Enchanted Labyrinth, which is based on Pushkin’s fairy tales; a well-appointed landscaped park with a man-made lake; ride carousels; and watch a variety of shows in the Theme Park’s theme areas. The Theme Park’s entertainment program includes performances by 150 artists from different regions of Russia.